Some artists work tirelessly on honing a certain sound, becoming known for their defined, polished take on a particular genre. Others though, are content to keep their options open, making house one day, hip-hop the next, or combinations of many different styles. Brian d’Souza is one such artist who likes to mix it up. Having already built up Highlife, a successful night in Glasgow, the Scottish producer released the infectious Goan Highlife 10” on the freshly minted Huntleys & Palmers label at the beginning of 2011. Its strains of African percussion, Indian flavors and an unmistakable nod in the direction of the UK funky sound earmarked it as an instant club hit. Little did we know at the time that this was just a taster for a full length album that would come out a little over a year later on the Huntleys label, and one that would further turn our expectations of what the producer could do. Since then EPs have followed for Kompakt and Mule Musiq, further widening the scope of what people consider d’Souza’s music to be. Wanting to quiz the producer about his artist name, his penchant for African music and a whole lot else, LWE opened up the lines of communication. 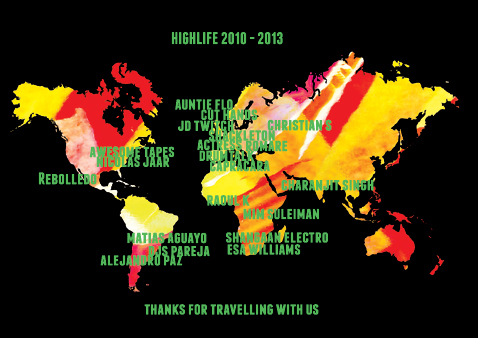 As well as filling us in on all of our queries, we were also rewarded with a stunning mix that spans continents, refuses to sit still, celebrates the 3rd birthday of the Highlife party and is also our 160th exclusive podcast. Auntie Flo is quite a distinctive name. What made you call yourself that? You’re of Scottish and Indian descent. Where did you grow up and what are your musical experiences with each country – perhaps if you have spent time living in each, what is some of the music that first stuck with you from living in each country? I was born and grew up in Glasgow so unfortunately didn’t really have much exposure to Indian music. My mum was actually born in Kenya so I always considered myself half African – it wasn’t till I left home that people pointed out that wasn’t quite true. A lot of people ask me if my heritage has influenced my music and it’s a really tricky question. Music is a massive part of my life and as well as the enjoyment of listening, I also enjoy the insight it gives you into different cultures. Maybe if I hadn’t had parents from different parts of the world I wouldn’t have had the same desire to explore musically, but who knows? There’s an obvious love of African music in your work. What turned you on to this? It’s been a pretty recent thing, I’d say the last five years or something. I remember getting a package of CDs sent to my company Open Ear (http://www.openearmusic.com) from the World Music Network. It contained their whole back catalogue of musical primers from loads of different countries and part of my job was to listen to them all and put them into categories. I remember discovering some gems such as Hanggai’s ‘Flowers’ (which i went on to edit) and lots of music from Africa. I’d been to Kenya a few years before and bought a few tapes, but nothing that was any good. Hearing this WMN selection really caught my attention and I started to seek out more music from Africa, quickly discovering South African house and kwaito which has so many similarities to the UK funky sound that was emerging around that time. That to me was really interesting as the two genres had come about completely independently of each other. As Auntie Flo you’ve been releasing for the past few years, but you’ve been doing this for quite a while haven’t you? How did Auntie Flo start? I’ve been DJing, producing and putting on parties for over ten years. 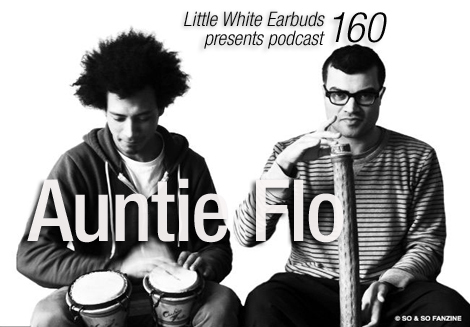 Around 2002 I made an EP under the name Auntie Flo which we toured around Scotland but it never got released. I kinda gave up producing under that name to focus on finishing my degree and then I got more into really experimental sound art stuff, remixing orchestras and sound design for films. It was only a few years ago I got back into making dance floor stuff and the name re-surfaced. Have you always played live sets or is that more of a recent thing? I’ve been playing live sets under different guises for over ten years but this wasn’t anywhere near the same as what we are doing now. I’ve done solo laptop sets, band stuff, AV stuff, live remixed orchestras using Max/MSP, sound diffusion multi-speaker ambi-sonic stuff over the years. However, Auntie Flo live as it is now only started in 2011 when I teamed up with Esa Williams and we worked out how the set should sound; no laptops, all analogue gear and live percussion. I understand your album was actually made up of material from the early 2000s. Tell us about the original writing of these tracks and to what extent were they remixed or remastered for the actual release? It was actually mostly made in 2010. I had finally got my act together and basically wrote the whole thing in one month, with most of the ideas being laid down in quick succession. Most of the final version was exactly as it is, other than we added the Mamacita vocal for La Samaria and Esa did some additional percussion and vocal elements. Huntleys & Palmers originally wanted to release it in 2011 but as they were a new record label they decided to release the dance floor singles first before the album. You’ve been running your Highlife parties for a few years now. What are the parties about? Highlife is all about exploring strands of dance music outside of the typical house/techno/ disco/dubstep canon, but at the same time avoiding what is classically referred to as ‘world music’. There is nothing wrong with any of that, just our mission was to do something different. We’ve been lucky to be able to bring DJs and live acts from all over the place, which has meant every night has been really different and really unique. Looking back, we’ve had acts from Mexico (Rebolledo), South America (Matias Aguayo, Ale Paz, DJs Pareja), Africa (Raoul K, Shangaan Electro, Mim Suleiman), the US (Awesome Tapes from Africa, Nicolas Jaar), and India (Charanjit Singh). We’ve also brought loads from Europe who we think fit our afrofuturist ethos: Actress, Cut Hands, Shackleton, Romare, Optimo etc. We want to challenge the western canon and show that truly original, ‘future’ music is getting made all around the world now and it can be enjoyed by everyone. Above all, the events have to remain as a ‘party’ and that’s the bottom line. When you think of the Glaswegian music scene your mind doesn’t immediately think of the vibrant, feel good strains of afrobeat. Judging by the fact your parties are still going I’m imagining it was quite well received. We don’t just do ‘feel good’ music. With the likes of Shackleton, Cut Hands, Actress et al we tried to show a darker side to the Highlife sound. In general though, Glasgow likes to party and is a really open minded place, so as long as we keep the dance floor going, people go wild. We wanted to take risks with Highlife; I remember talking to Keith from Optimo before our first party and he said it was ‘the night he always wanted to do but never had the balls to do it’. How did you originally meet Esa and when you play live what do you each do on stage? We met at a MOBO event in Glasgow which I was helping to run. Esa was speaking on a panel and doing some drumming after, and I got chatting to him then. At that point I only had an idea in my head what the new music I wanted to make but we exchanged details and I said I would be in touch. It took me two years but eventually I got back to him when I had some of Future Rhythm Machine written and glad he remembered! Is his involvement in Auntie Flo strictly on a live basis or does he also contribute to studio sessions? You started a series of releases last year called Rituals. What’s the idea behind it? I don’t produce music all the time, I tend to go through phases. So I’ll spend 2-3 weeks making tracks and then do nothing for a few months due to other commitments. Rituals was a name to tie together a series of tracks I made last summer. I made Sun Ritual for our annual ‘Sun’ Highlife party (where we get all these massive audience blinder lights and give out sunglasses to the crowd to protect their eyes. The other tracks Kisumu and Mela were made around then. They all fit together to a more organic techno kind of sound, which was different to the stuff I made previously. I’ll definitely make some more tracks for the series at some point. What can we expect from Auntie Flo over the next year? We’ve just revamped the live set for 2013, so hopefully playing that out a lot more. We’re doing a few of the summer festivals and playing at H&P showcases at venues like Fabric (18th May) and Razzmatazz (23rd August) I’ve got a release via Innervisions’ Philomena label dropping in early June, various other remixes, some new stuff on H&P and a release via Cómeme coming in the 2nd half of the year. We’re also moving Highlife to London; the first party is on the 15th of June in at Corsica studios with Heatsick and Awesome Tapes from Africa, as part of James Holden album launch and we’ll also be doing our 3rd annual ‘Sun Ritual’ party at some point over the summer. really nice mix! Music that transcends any of the more dubious appropriations of Dutty Artz/’global bass’ et al. why are these guys named after menstruation? oh, disregard, answered in first question of interview. not a very good answer, but an answer nonetheless.